At Picture Mosaics, we’ve spent the last 14 years pushing the boundaries of photo mosaic design in every way imaginable. 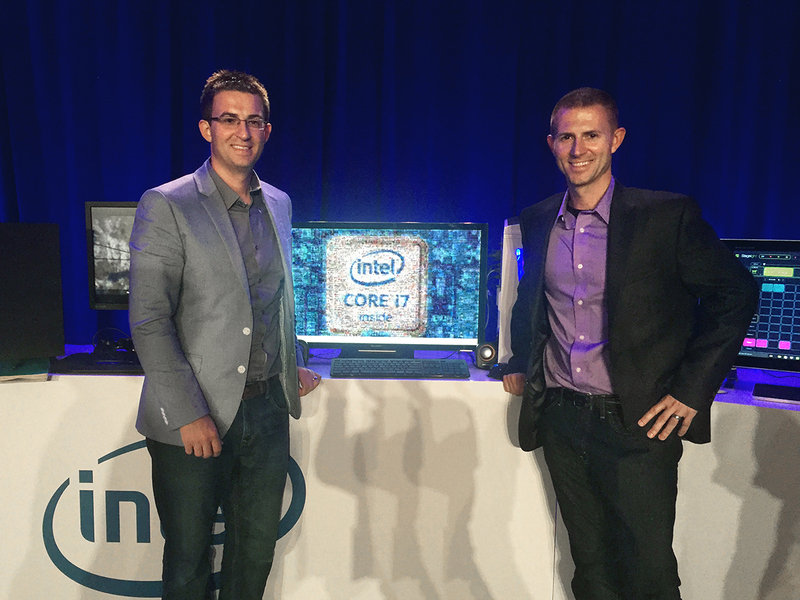 We were honored to partner with Intel and present at the IDF 2015 press event in San Francisco! We were tasked with putting together a demo using our latest photo and video software to push the new Skylake i7 processor to its limit. Currently, our Online Mosaic Tool can leverage your photos from any device, Facebook account, Instagram account, and other online sources and with in minutes build a zoomable, printable, and sharable photo mosaic. With the launch of the new Skylake processor, our app and technology would be pushed further…we were really excited for what this meant for our customers and cleints! Once the new skylake i7 system arrived, we were left with one question: with all of this power, how far can we push our creativity and technology to further what consumer can do with their photos and videos? We decided to undertake one of our most ambitious mosaic projects to date: an interactive, 3-D video mosaic sphere comprised of 40 4K videos, all playing simultaneously! Using a touch screen monitor, we could rotate, explore, and zoom into the sphere without compromising the playback of any 4K video. You can check out a clip of the interactive sphere in action at the Intel event on HardwareZone.com, or check out the video at the bottom of this post. What’s more, we used this 3-D sphere as the basis when creating the new never-ending Intel video mosaic. We knew the Skylake i7 processor would takes us leaps and bounds ahead in this area, but what we weren’t expecting was our render time to drop from twelve hours to just FIVE hours. We were truly blown away. This new processor is sure to be a game-changer for all of our future interactive and video mosaic projects. We are excited that more of our interactive 4K mosaic technology, optimized for Skylake, will be featured in several upcoming Intel events.